UNITED NATIONS, January 27 -- In Gabon opposition leader Andre Mba Obame declared himself his country's real leader -- taking a page from Alassane Ouattara in Cote d'Ivoire -- and sought both UN recognition and protection. In the latter, his precedent may have been the UN mission in Guinea Bissau, where an indicted drug kingpin enjoy UN protection for months a year ago. Inner City Press has repeatedly asked the UN why it protected a drug kingpin and was told, in essence, it was hard to get him to leave. On Gabon, we have the following: Mr. Andre Mba Obame, Leader of the “Union Nationale”, is in the UN compound, along with party leaders. Obame handed a letter to the Resident Coordinator requesting UN protection, stating that they fear for their lives if they step outside of the UN office. The Resident Coordinator is consulting with authorities on the ground and with UN Headquarters. The government of Ali Bongo has dissolved Obame's party and blocked his TV station. One difference in how this will play out, a cynic opined, is that Gabon happens to be on the UN Security Council and could make its voice heard. Watch this site. 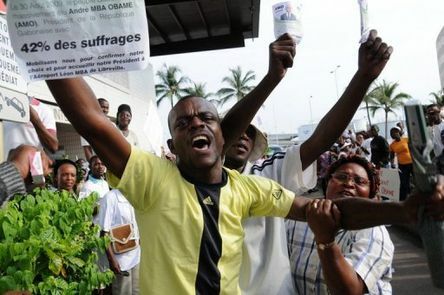 Footnote: Obame and his band of 20 sought refuge in the UNDP building in Libreville. In terms of UNDP's position on democracy, while protesters in Yemen are now calling for Tunisia style changes, Helen Clark was just in Yemen for days, praising the government. Maybe the Yemeni government used her and the UN? UNITED NATIONS, January 17 -- While in Tunisia Ben Ali's foreign minister Kamel Morjane, who served for years as deputy to the UN High Commissioner for Refugees, still remains in his post, in New York on Monday Inner City Press asked Secretary General Ban Ki-moon's spokesman Martin Nesirky if there is any discussion of sending a UN team to Tunis. “Not to my knowledge,” Mr. Nesirky said. Video here, from Minute 19:48. 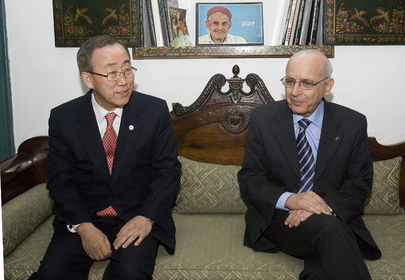 Sources tell Inner City Press that the UN Office of the High Commissioner for Human Rights contacted Ban Ki-moon's office to say that it is considering sending a mission to Tunisia and wanted to know if Ban's Secretariat is also making such plans, in order to coordinate. Ban's Office according to sources within it subsequently answered no, no plans for a mission to Tunisia. The sources describe a background memo to Ban about Tunisia, urging that he support efforts to override a two month Constitutional period to form a new government, granting six months so that "Communists and Islamists" don't have an advantage over "moderate forces." At Monday's noon briefing Nesirky was asked why Ban has been so weak in his response to Tunisia. 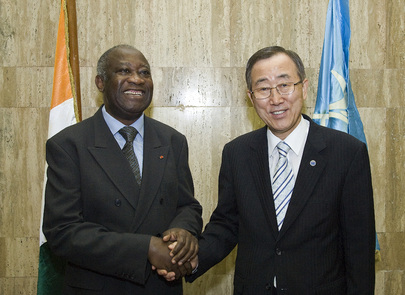 While Nesirky contested this, some compare the response to that in Cote d'Ivoire, where Ban urged the UN General Assembly's credentials committee to remove recognition for Laurent Gbagbo's UN ambassador. Inner City Press asked President of the General Assembly Joseph Deiss if any similar move is afoot in the GA's credentials committee regarding Tunisia. “Not so far,” Deiss answered, explaining that the Ambassador appointed under Ben Ali had yet to be contested. Video here, from Minute 19:57. Last month Inner City Press questioned Tunisia's Ambassador in press conference at the UN after he bragged about human solidarity and banking in his country. Inner City Press asked about the youth conference Tunisia had said that it would hold. The Ambassador blamed other states for not coming through on financial pledges. In New York over the weekend, while there was rally in Union Square, Tunisia's elegant Mission just north of the UN was not targeted. Watch this site.